Delta has announced a new 14-inch bandsaw that features a 1 HP, 115V/230V, 1 phase TEFC (Totally Enclosed Fan-Cooled) motor. 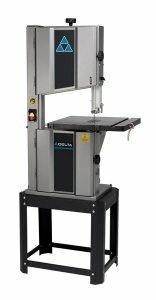 The new 28-400 bandsaw is built around a heavy-duty steel frame and sits upon a steel stand, both of which are said to reduce unwanted flexing. A relatively small foot-print and a 6-inch high cutting capacity should make this saw a good home workshop option. A two-speed pulley (1,620 FPM and 3,340 FPM) with an easy to use tensioning system allows users to make quick and easy speed changes. Aluminum 9-spoke rubber-tired wheels make up the upper and lower wheels which come pre-balanced for better blade tracking. The lower wheel has a dust brush to keep the blade clean during operation, and a 4-inch dust port can be hooked up to a collector to help keep your shop clean. The 28-400 uses a large oversized table that is made of cast-iron and has been precision ground for flatness and features a 15-3/4-inch x 18-7/8-inch surface that tilts 3-degrees left, 45-degrees right, and has a positive stop at 90-degrees. A larger table insert was used to provide greater visibility when changes are required on the lower blade guide. Both upper and lower blade guides use ball bearings to ensure smooth. The table has a standard 3/4-inch x 3/8-inch T-slot that can be used with an option miter gauge or any number of after market accessories. The Delta 28-400 14-inch Bandsaw suggested retail is $629.99 and includes a 93-1/2-inch wood-cutting blade. It will be available at dealers in April, and comes with a 5-year warranty.